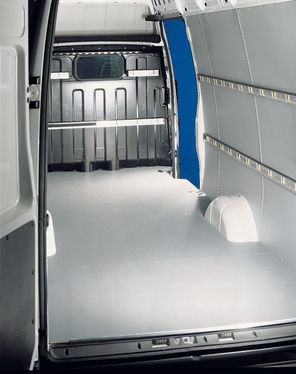 The Soboflex safety floor is the basis of every in-vehicle equipment installation. It protects you and your vehicle. The Soboflex safety floor consists of non-slip 9 ply waterproof (in accordance with BFU 100) laminated, Nordic Birchwood, which is highly resistant to wear – much more than normal plywood. Soboflex is suitable for many different transportation tasks and goods, including very heavy loads. You can always rely on your safety floor. The safety floor is resistant to oils, petrol and most chemicals. It protects the loading area and is easy to clean. The safety floor is precision cut for all vehicle types. Sortimo Globelyst in-vehicle equipment is bolted down to the safety floor. No drilling of the vehicle floor is needed and rapid installation is achieved. Support, protection and safety. 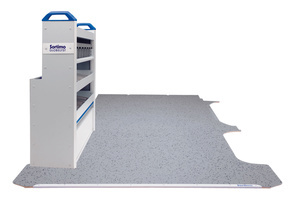 SobogripPlus is a suitable alternative to the Soboflex safety floor. SobogripPlus along with the Sowaflex wall cladding guarantees perfect protection for the inside of your vehicle. The protective floor is ideal for all delivery applications such as courier service vehicles and companies with different goods to be transported. Even when carrying heavy loads, these companies can rely on the tough, 9 mm thick floor protector. As with our Soboflex safety floor, our SobogripPlus floor inserts are precision cut for all vehicle types. The studded finish is highly resistant to cracking and shock loads. The SobogripPlus surface veneer is non-slip even when wet – even after years of wear. The floor insert is easy to clean and resistant to oils, petrol and most chemicals. Sortimo Globelyst in-vehicle equipment is bolted the SobogripPlus. No drilling of the vehicle floor is necessary.